Production print isn’t just for designers and marketing professionals. Promotional material is part of the branding process for many small businesses. Third-party print shops may seem like the obvious solution, but becoming your primary source for production print has many benefits. In fact, any company that frequents standard forms, direct mail, or brochures can take advantage of the latest technologies in production print. In-house Brand Control – Consistency is critical to the branding process. Promotional digital print material is a way of showing your customers and other professionals what your company is all about. Your logo, designs, and message need to support an accurate portrayal of your business, and with nothing between you and the material, you have more control over what the result is. Cost Transparency – When you outsource print, hidden markups can add up. A production printer lease in-house helps you manage a budget by providing you with the same finishing options for less, so you get to choose how much money you spend and save. Ready When You Need it – Timing is critical to achieving your business’ goals. 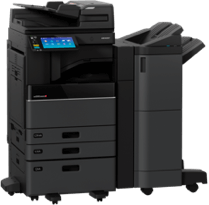 If your organization acquires a high-volume workload with time constraints, in-office digital production equipment delivers professional imaging at high speeds for a more productive and efficient workplace. Security – Privacy counts, and when your team is in charge of handling company data and digital files, sensitive content is more secure. Longevity of your print infrastructure – It can be tempting to use existing print technology in the office for larger colour print jobs. 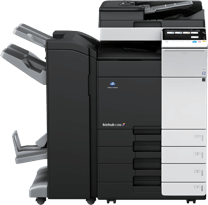 These machines aren’t designed to take on this work load, and the misuse of your copier leads to premature wear and tear and interrupted workflow. Using the right equipment gets you the most value from your lease. At Business Systems, we specialize in office technologies that improve efficiency and productivity using cutting-edge digital solutions for the modern workplace. To find out more, click below for your fast quote and free consultation. Contact Busys.ca today for a quote!